← First Strawberries of the Season: May 7th! 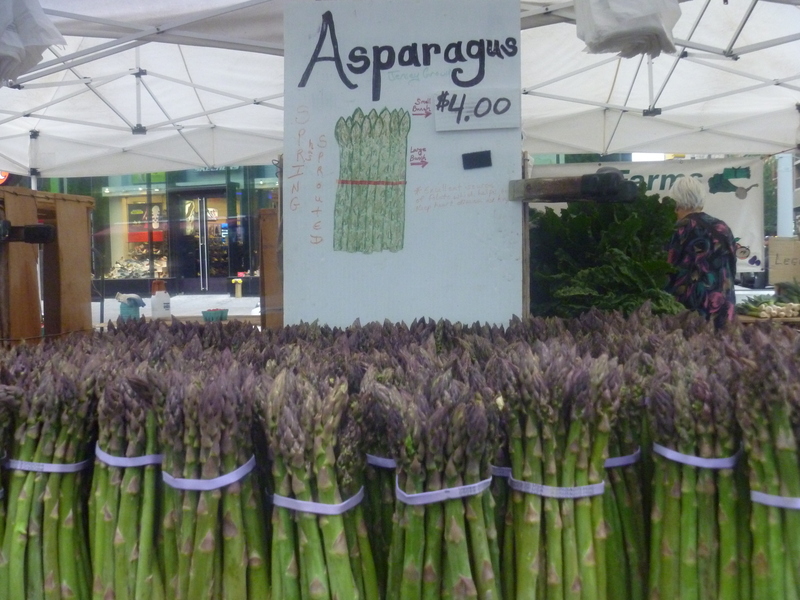 It’s been an awesome season for Asparagus. The first several pounds of it that I go were thin, sweet, stalks that barely needed to be cooked. This weekend we made a lunch with them, that was so simple and so tasty. 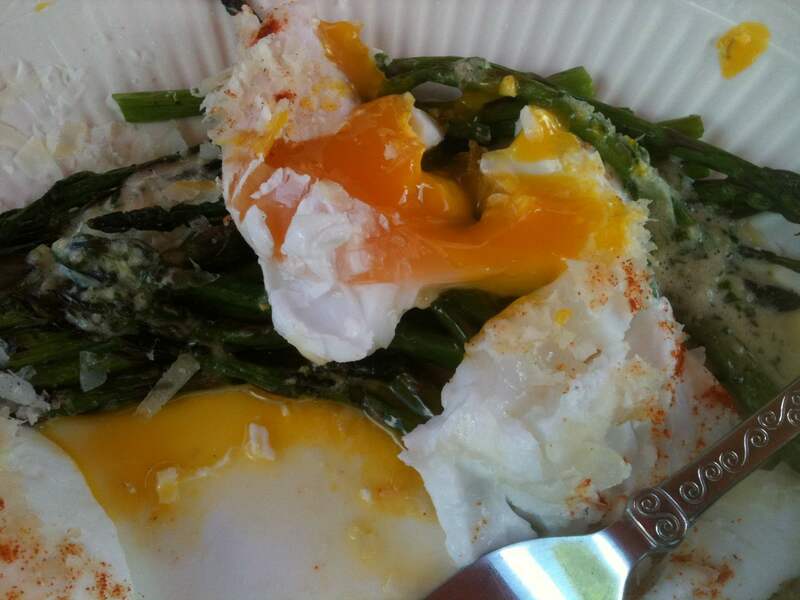 Grilled Asparagus with Duck Eggs coated in my new favorite thing: Tarragon Vinaigrette. Below is the vinaigrette, which is actually redolent of fresh tarragon, but you can’t really see that in the picture, but trust me when you taste it you will see. This recipe can go a few ways. 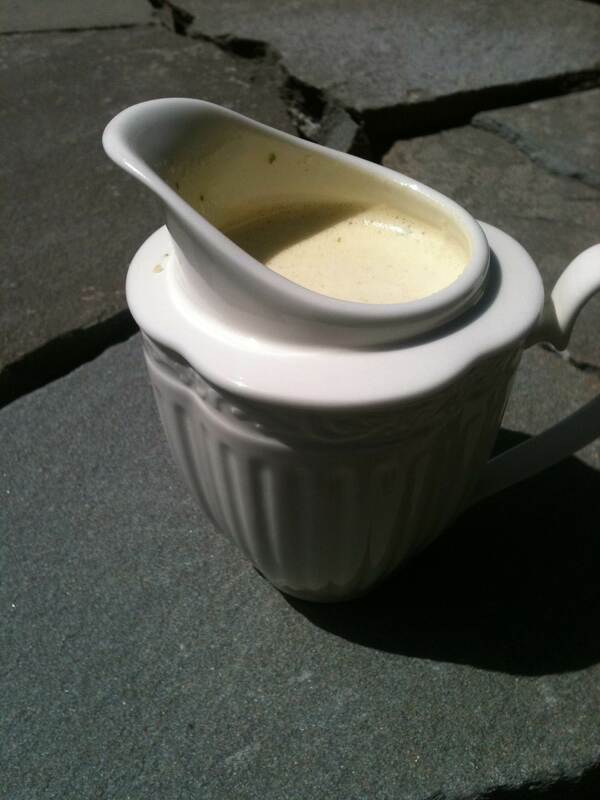 If you make it in a blender and pour the oil in slowly you get a thicker sauce well you get a mayonnaise, of you don’t have a blender and you want to just through everything into a food processor you will get a foamy thick-ish vinaigrette. Of course if you are feeling old-fashioned you can accomplish either of these variations with a bowl and a whisk. One last thing this is a great way to dress any salad, so knock yourself out….shaved fennel, radish and romaine or frisee with lardons and croutons are two ideas that come to mind. My preferred way to make this is in a blender, but I will give options as we go. Place 1 large Organic Egg Yolk, a generous 1/4 cup Tarragon leaves, 1 Tablespoon of Local Honey, 1 Tablespoon of Dijon Mustard, 1/4 cup roughly chopped sweet onions (spring onions, red onions, shallots, I’ve even used plain old cooking onions: all worked fine) and 1/4 cup White Wine Vinegar in the blender jar cover with the lid and process for 30 seconds – until everything is well blended together, remove the middle part of the lid and then slowly pour in, while the blender is going 1/2 cup of oil ( a 50/50 mixture of sunflower and olive oil or any unflavored oil and olive oil works. If you only have olive oil it works, but has a strong more, well, olive oil flavor). When the oil has been add turn off the blender, add sea salt and plenty of freshly grated black pepper. Taste it, you may want to add a little more vinegar (or a dash of lemon juice) or a little more honey or more salt and pepper. Now is the time to add it as mixing it in the blender makes it a cinch! If you are doing it in a bowl do it exactly as described above only place the bowl on a damp tea towel (so it will stay in place) and slowly whisk in the oil. In a food processor just dump everything in and pulse it until it’s foamy and a consistent texture. Easy. In a pan of simmering water add 1-2 teaspoons of white vinegar. Carefully add the eggs one at a time cook until the white have just come together – don’t over cook. 1-2 minutes should do it. They should be runny. 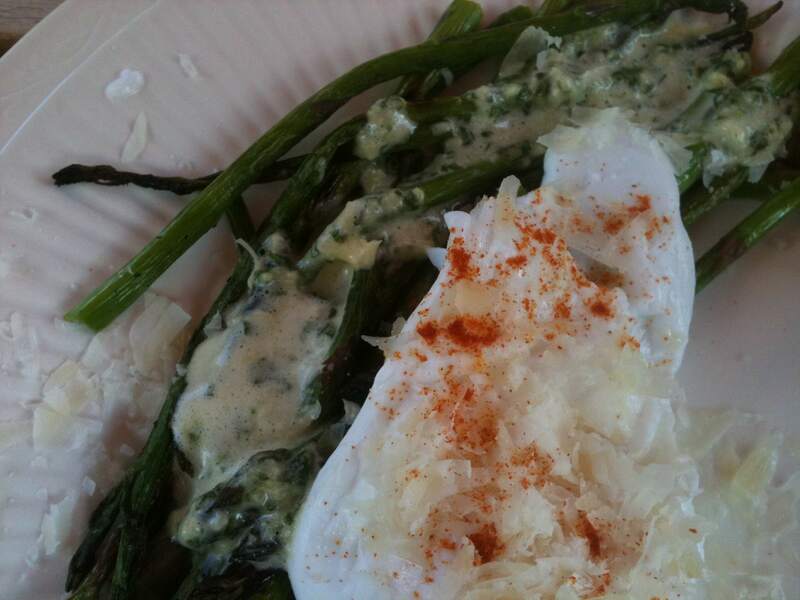 To Plate: Place the cooked asparagus (roasted, grilled, poached all are good) on a plate (or plates) place poached eggs on top (2 per person if for lunch or if for a side dish, 4-6 for about 1 1/2 pound of Asparagus), pour over the Tarragon sauce and top with a sprinkling of freshly grated Parmesan cheese. Serve with roasted potatoes or good bread or both! Above our brunch table in the country. Below a close up of the plate. My host Jeff is a big fan of good Hungarian paprika so he sprinkled over the eggs. he also made grilled bread. He has a very fancy stove with a wonderful grill which he makes good use of! 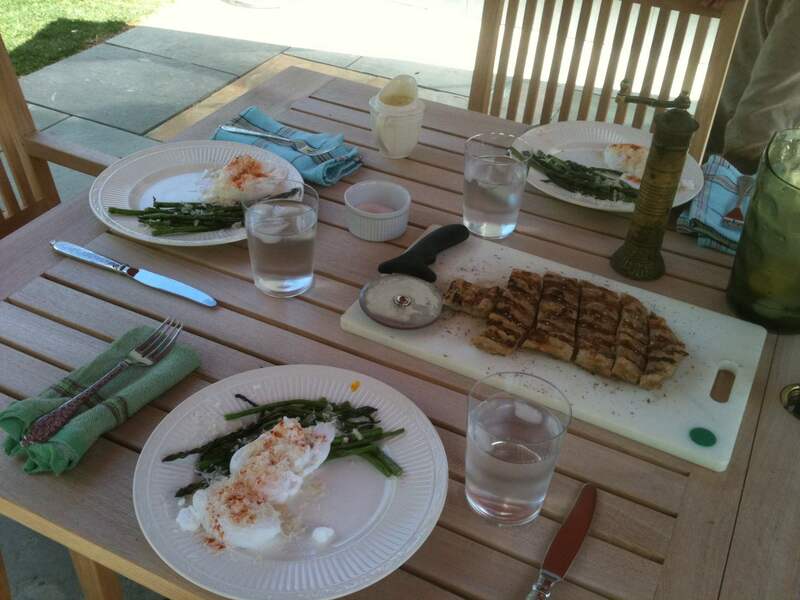 This entry was posted in Recipes and tagged Brunch, Duck Eggs, Tarragon Vinaigrette. Bookmark the permalink.